The "Tent of Tomorrow" was listed on the National Register of Historic Places in 2009. Fifty years ago today, the world flocked to Queens, New York, for a glimpse of utopia. Adults paid $2 for admission to Flushing Meadows-Corona Park, and what they got in return was the next best thing to an actual trip to the moon. Scattered throughout a 646-acre urban oasis were 150 fancifully designed pavilions showcasing inventions that promised to boundlessly transform life and how it was lived. There were lasers, mainframe computers, ten-story tall rockets, touch tone telephones, microwave meals, color televisions -- even a dishwasher that melted washed and dried plastic dinnerware into new cups, plates, and saucers. The future was here, and everyone was a Jetson. It was the 1964-65 World's Fair, and it arrived at a pivotal time in our country's history when the allure of putting a man in space was tempered by more turbulent news of civil rights clashes, Vietnam casualties, and the assassination of President John F. Kennedy. 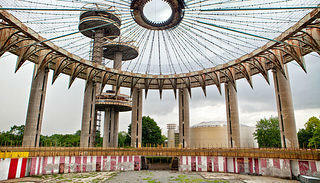 It was on the doorstep of this new frontier that master architect Philip Johnson designed the New York State Pavilion, a structure that not only embodied the world's collective hope for the future, but one state's ambition to be the cultural and technological center of it. Commissioned by Governor Nelson Rockefeller, who wanted the host state to have the largest and tallest venue for all the futuristic festivities, Johnson's ode to the Empire State was a focal point of the fair and an instant favorite among visitors. The monumental concrete and steel structure combined a theater, three observation towers, and a 100-foot high, open-air elliptical ring into one stunning, Space Age structure. Dubbed the “Tent of Tomorrow,” the Pavilion’s main exhibition space dazzled and delighted fairgoers with the world’s largest suspension roof and a terrazzo road map of the State of New York. As noted architecture critic Ada Louise Huxtable famously put it after her first visit, "This is carnival with class." 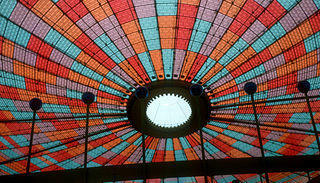 But it wasn't just the colorful "Tent of Tomorrow" that ignited imaginations. For an admission fee of fifty cents for adults and twenty-five cents for children, the Pavilion's three "Astro-View Towers” provided unparalleled views of the fair and the sprawling city that surrounded it. Visitors were enticed to experience a "breathtaking rise" in “Sky Streaks” -- capsule elevators that offered "not only a dramatic ride, but the feeling of a free ascent through the air." 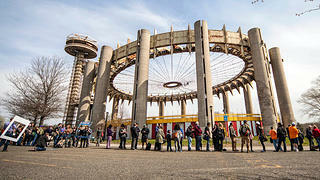 The World's Fair concluded after two six-month seasons that drew and estimated 51 million visitors to Flushing Meadows-Corona Park. While the vast majority of the structures constructed for the event were either demolished or relocated, the Pavilion remained in active use for years as a community roller rink and concert venue. However, by 1976, its iconic roof was declared unstable and removed, leaving the ornate map exposed to the elements and the Pavilion’s future in question. Today, on its 50th anniversary, one can't help but think of other World's Fair structures that have fared better than the Pavilion, including the Eiffel Tower and Seattle’s Space Needle. 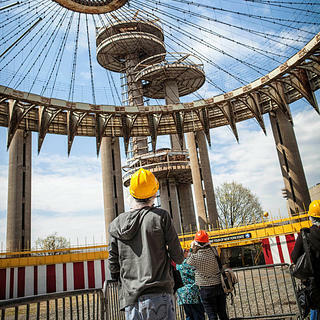 Visited by millions annually, these cherished places live on as local and national icons — a future the National Trust envisions for a restored New York State Pavilion, too. That’s why we’re naming it as our newest National Treasure. While studies have shown the Pavilion is structurally stable, it requires at least $40 million in repairs after many years of disuse. With today's announcement, the National Trust is on the ground working with local preservationists, partner organizations, and elected officials to advocate for the Pavilion's restoration, but we need your help. We ask that you please join our campaign to save the Pavilion by petitioning New York City Mayor Bill de Blasio to make rehabilitating this National Treasure a priority of his administration. Together, we can ensure that the “Tent of Tomorrow” is around for many tomorrows to come. 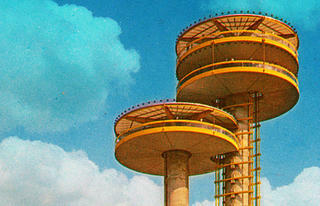 To learn more about the New York State Pavilion and our partners, please visit SavingPlaces.org. 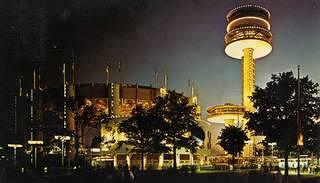 Also, use hashtag #NYSP50 on social media to follow along as we celebrate the 50th anniversary of the World's Fair. Jason Clement is the Director of Marketing Campaigns at the National Trust, which means he spends his days (and most nights) talking with people about how they can save the places that matter to their communities.